Start off your visit on the 20th (Tue): make a trip to Aberdeen Clock Tower and then step off the mainland to explore North Bay Island Andaman. For more things to do, maps, traveler tips, and tourist information, use the Port Blair trip planner . Use the Route module to see travel options from your home to Port Blair. Expect a daytime high around 36°C in November, and nighttime lows around 29°C. 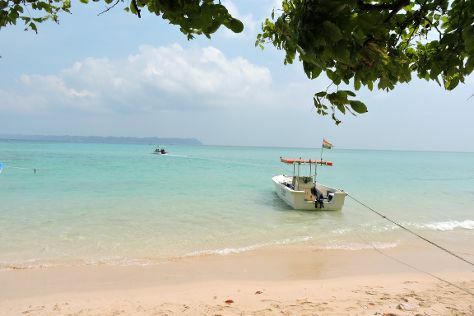 Wrap up your sightseeing on the 21st (Wed) early enough to travel to Havelock Island. Kick off your visit on the 21st (Wed): tour the pleasant surroundings at Elephant Beach and then enjoy the sand and surf at Radhanagar Beach. Keep things going the next day: get a new perspective on things with Boat Tours & Water Sports and then kick back and relax at Kalapathar Beach. Plan a trip to Havelock Island easily and quickly by telling Inspirock to suggest an itinerary. Traveling by car from Port Blair to Havelock Island takes 3.5 hours. November in Havelock Island sees daily highs of 36°C and lows of 29°C at night. Wrap up your sightseeing by early afternoon on the 23rd (Fri) to allow enough time to travel back home. To see reviews, photos, where to stay, and other tourist information, read our Neil Island trip itinerary maker site . The Route module can help you plan travel from Havelock Island to Neil Island. In November, plan for daily highs up to 36°C, and evening lows to 29°C. You'll set off for home on the 25th (Sun).